You are in your Blackboard grade center in your course. There are plenty of columns, in fact you are pretty sure there are more than you can see at the moment. But … there is the vertical scroll bar… and there, I’m pretty sure, is where the horizontal scroll bar should be, but it is not. 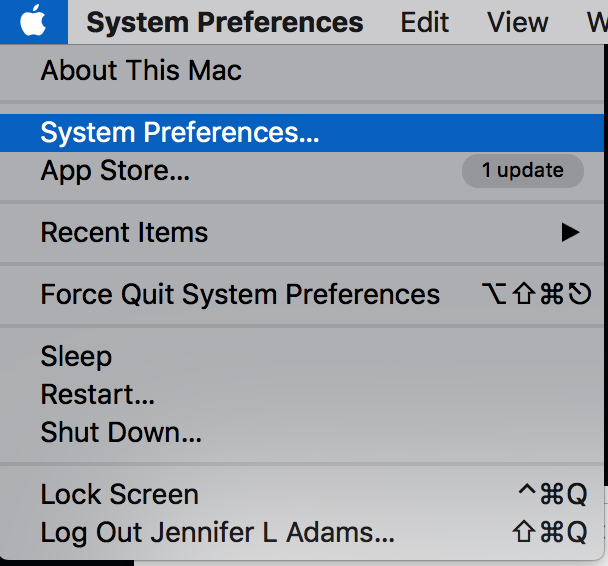 OK – this is a system setting on your Mac. Go to the Apple menu. and finally, make sure “Show scroll bars:” is set to Always. I have written about this before, but the clicker looks different, so I thought it was worth going over again. And when the student answers, they get a confirmation that the answer was received, and as long as the poll was given some grade, they may also get points in their blackboard grade book. The student also gets a happy confirmation that this has been sent.. and messages can only be sent when the polls are open. But there are no grades or points associated with this activity, and if they believe they have answered a poll, they will get a zero. As the instructor, you can check to see if this is happening in your class by opening the TurningPoint 8 software, go to the Manage tab, select a session file and click on Reports. You have students who are sending messages, thinking you will see them and respond. 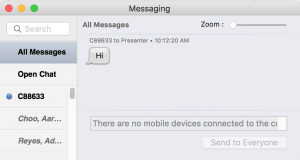 If you would like to see messages during class – you can. Has stuff stopped working in your browser? I was having more and more trouble as time went on with some features in echo360’s editing area. It sends an error complaining about flash not being new enough… but I knew I had the newest one installed… very frustrating. 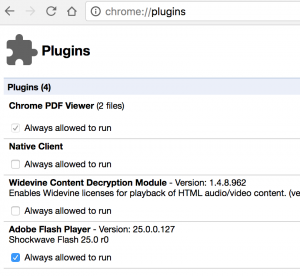 I know that Apple and Adobe don’t always get along – especially when it comes to Flash, so I just went with it for a bit. 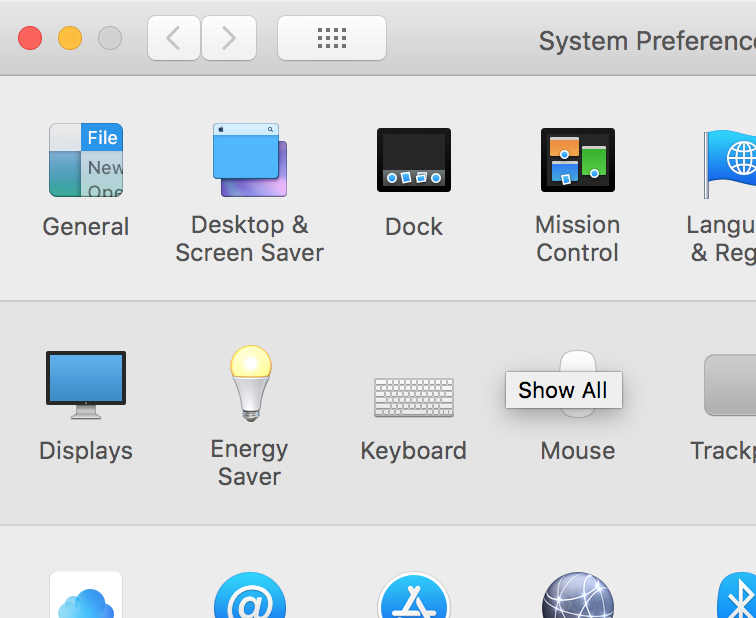 But hey – turns out that there is an actual solution, and it isn’t in the apple preferences, it’s in the browser preferences. The other fun bit, is you can’t just pull down a normal settings menu and expect to find this… you have to type into the URL field: chrome://plugins to get to these preferences. We use clickers with an LMS – namely Blackboard (9.1.110082.0). When you use an LMS, you need to register your online Turning Technology account with your school email address and indicate that you are either an instructor or a student. Once registered as a student you can not start the TurningPoint Cloud program. 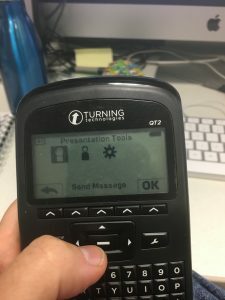 So, if you have to use clickers for a class – and you have to run the software because you are a TA, you will need to use a non-university email to register as an instructor. You won’t be able to sync anything like your roster, because the email address isn’t associated with your LMS. No explanation has been giving for why allowing students to run the program is such a bad thing. Once registered as an instructor, you can not register a clicker. 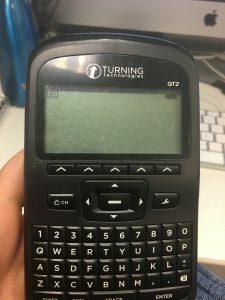 The instructions for how to use your license code that come in the box with a new clicker, contain instructions that are for students that do not use an LMS. Following them can result in needing Turning Technologies’s support people to assist. 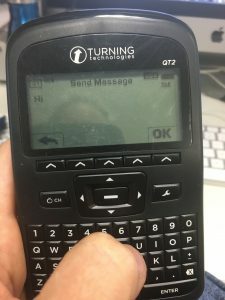 Courses that have rosters of more than 400 people cannot successfully connect with the Turning Technologies server without experiencing a time out. This goes for downloading the participant list and also for uploading grades. Turning Technologies currently is manually delivering the participant lists to our instructors via a support account that has been entered into those classes as a TA or Instructor. They are working on this and need to fix it. Fixed by software update from company. On the other hand, maybe not. they are blaming our Blackboard “trafficking” on server time out issues. Courses with large enrollments also getting server errors when attempting to start responseware. Fixed by software update from company. ?? 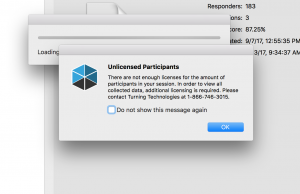 During the first two days of class, students were receiving messages when trying to register saying that the code was invalid – but this was only because their server was over welmed. Apparently it was actually taking the license. If a student tried again later, they would get a this code has already been used error. 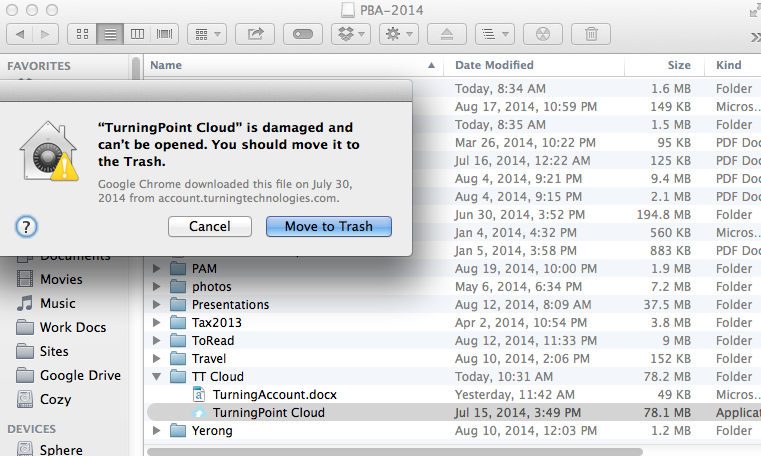 Due to the tightening of security on the turningpoint system, session files and participant lists can no longer just be shared with another person by dragging it out of the folder and attaching to an email or shared drive space. (Note course coordinators!) 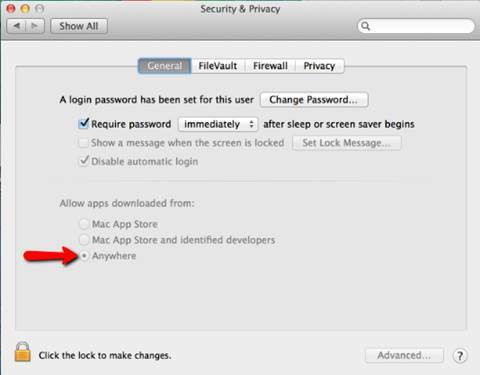 These files must now be exported with a password that you then share with whomever you want to be able to open the file. There is no longer a lookup device IDs for students who have registered in the Cloud only. I used to use the Device ID lookup tool quite often to assist with Lost and Found devices. 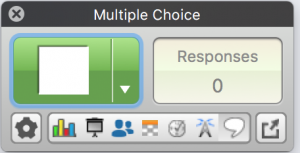 Using RemotePoll for remote clicker sessions (we use it mostly for courses where we have more students than we can fit into one room. In this case we would stream the video into a second room and setup remote poll so that the students in the overflow room can still participate with the clickers), is now only between two windows machines over direct IP. It used to have to be on a windows box in the remote room, but could be mac on the presenter machine. I will update this as issues are resolved. Our classes started on 8/25/14.